"We've been patient for so many years, for 12 years," said Wahed Al Jabry, board director at the Downtown Mosque. "And now only a few days left. Thank God at least we can see the sunlight.'" Downtown Mosque leaders wanted to unveil their new mosque on York Boulevard Thursday, timed with the beginning of Ramadan, the holy month during which Muslims refrain from eating between sunrise and sundown. But it's not quite ready. There have been a few delays getting all the doors and features in place. Anticipation for the mosque's new home is high. "We've tried our best. So many brothers and sisters in the community, they want to eat my head," said Wahed Al Jabry, the mosque's board director. "But when I am talking to my community, I say, 'We've been patient for so many years, for 12 years. And now only a few days left. Thank God at least we can see the sunlight.'" He said the move-in will come soon. within a week or two — not for the start of Ramadan, but at least for part of it. "We'll be here in one of the days of this month, Ramadan," he said. The highly multicultural congregation bought the building last year after launching a fundraising campaign for the $3.5 million deal in October 2013. It is moving from its former Wilson Street location. The 35,000-square-foot building was formerly a Century Fitness. The vision for the new space is for it to eventually feature a recreation centre, programming for newcomers to Canada, a daycare and an elementary school, he said. "I have a feeling of satisfaction and pride that we have accomplished something very important," said Imam Sayed Tora. "Not just for the Muslim community but also the downtown core." ​The Hamilton Downtown Mosque was founded in 1992 and boasts a membership of around 3,000 families, many of whom are newcomers to Canada. It has members who originate from scores of countries, including Somalia, Ethiopia and Bangladesh, among others. 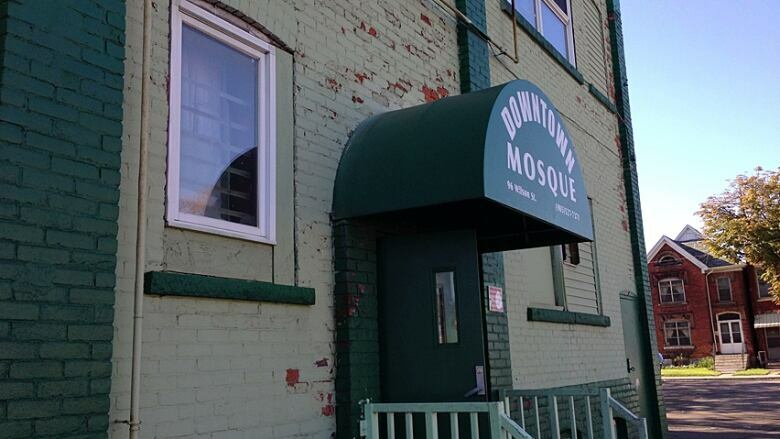 The Hamilton Downtown Mosque is currently located on Wilson Street at Catharine Street, in the city's Beasley neighbourhood. (Samantha Craggs/CBC)The mosque's burgeoning population led its leaders to look for ways to expand the facility. They were involved in years of discussions with city hall and the Hamilton Police Service over the plot of land that sits behind the congregation's current building. In October 2013, it embarked on a public campaign to buy the property at 221 York Blvd. The mosque agreed with the landowner to pay the full $3.5 million by December 2017. It has $1.8 million left to raise on the building deal, and less than $50,000 left on the $600,000 renovation bill, Tora said. "We are getting there slowly but surely," Tora said.